What at first appeared to be a full-scale purge of anime at Hulu turned out to be a far less-drastic but systematic cull of low-rated titles. Live-action Japanese television series are pretty much gone altogether (as always, Korean dramas are alive and well). So what threatened to be a ruthless application of the 80-20 rule ("Twenty percent of inventory accounts for eighty percent of sales") was more the lopping off of the bottom 10 percent. The way CEO Jack Welch once boasted of running General Electric. I suspect Hulu will be repeating this "Rank-and-Yank" process on a regular basis. In other words, truncate the long tail and concentrate on hits. Or at least the midlisters and up. And let's be clear: including the midlisters and up, Hulu still has a ton of anime. Incidentally, this is why Cosco has three times the earnings-per-employee as Walmart and thus can pay a higher base wage. Cosco carries about 4000 SKUs while Walmart warehouses a staggering 140,000. It costs big bucks to maintain that physical inventory. When it comes to anime, Hulu wants to be more like Cosco. So does Netflix. Or rather, more like HBO: produce a few shows that capture the cultural zeitgeist and backfill the rest with reruns of standard Hollywood fare. It's about "narrow-casting" to the broadest possible audience. In other words, the subscription model since forever. Rather than broadcasting a signal to the whole wide world and hoping a few percentage of available households tune in, send it instead only to the viewers who already have a vested interest in watching. As the cable industry has long proved, if you can get subscribers hooked on one or two channels (or even one or two shows) and fiddle with the packages to hide the sunk costs, they'll stick around out of sheer momentum. In his 2004 treatise on the subject (and 2006 book), Chris Anderson cited Netflix as an example of the long tail in action. Streaming would seem to bolster his argument. Except what Netflix really wants is a heavily curated long tail. That's not too long. Today's Netflix and its "brand halo" seem to have a lot more in common with existing TV channels, most obviously HBO, than the back-catalog specialist that it was back in 2006. I don't think Chris Anderson was wrong about the long tail, simply wrong about it aggregating under one roof, the exception being virtual department store retailers like Amazon and Walmart. But even those behemoths can't stock everything. The long tale very much exists, except it's been it's been stretched and scattered across all creation. So it takes a bit of dowsing to find the viable concentrations of your particular ore.
One thing remains very true about Anderson's original thesis: going completely digital cuts inventory costs drastically. The marginal costs for adding each additional title or user are close to zero. Which is why Amazon could build out its existing infrastructure and turn AWS into such a profitable enterprise. And why every new software play must somehow leverage the "cloud." The challenge is what to do with it, how to collect and collate all the content to fill it. Sure, information wants to be free, but the licensors are still going to charge whatever the market will bear. And there's no better way to get control over content licensing fees than to produce it in-house. Though as HBO has discovered, getting irrationally exuberant with that approach can lose you your shirt. Netflix has already been the principal producer on several anime series, and adapted Matayoshi Naoki's award-winning novel Hibana for a series that will be shown in all Netflix markets. Here the advantage goes to streaming over the traditional cable model. But for those of us not so much interested in the smorgasbord? The past is prologue and streaming economics hearkens back thirty years when the average middle-class household had a dozen magazine subscriptions (not counting the catalogs). "Big tent" at one extreme, (extremely) specialized at the other. Such as a newsletter just for the QX-10. My dad subscribed to one of those. Today it'd be a website. Going forward, the streaming market in the U.S. will probably be left with Crunchyroll, Funimation and maybe Hulu as the major online anime distributors, with Amazon and Netflix providing a generous but more curated catalog. At the end of the day, though, when everything shakes out, we'll still have orders of magnitude more choices than the bad old days of praying for a single new anime release to show up at Blockbuster. The "slice-of-life" genre (manga and anime) intersects, but should not be confused with, "slice-of-realistic-life." Bunny Drop gives us a slice of life, but it's not quite "slice-of-life." Rather, it's better described as a family melodrama (quite a good one, in fact). 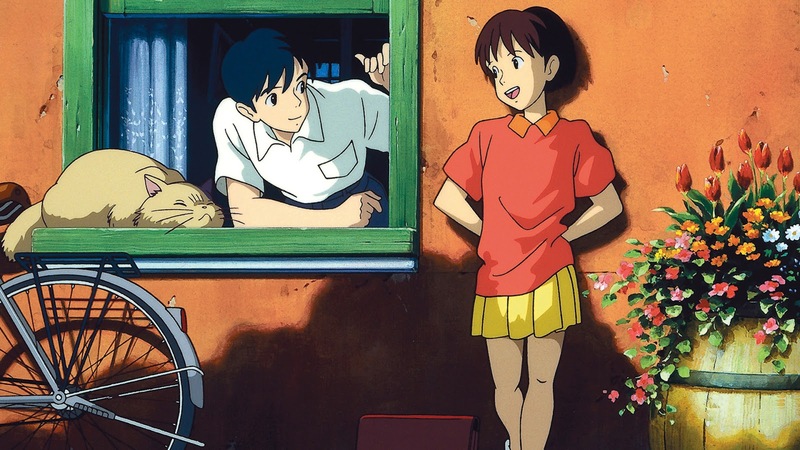 To put it in Studio Ghibli terms, Only Yesterday is slice-of-realistic-life (another good one). Whisper of the Heart is slice-of-life. Of course, genre categories always get blurry at the edges. Hanasaku Iroha qualifies as a standard melodrama, replete with character development, a plot, and an ending. But its setting and emphasis on day-to-day life at a rural inn also tips it toward slice-of-life. More importantly, a slice-of-life story doesn't weigh down the audience with heavy attitudes or a ponderous plot (at least not for long) and goes easy on the "meaning of it all." The tone is upbeat, the characters optimistic. If there are issues, people get over them. In short, "stuff happens, mostly pleasant." A healthy serving of moe makes it easy on the eyes too. A touch of magical realism and nostalgia calms the nerves, even in the future. Aria and Yokohama Shopping Trip are two classic slice-of-life science fiction series. Whole chapters are devoted to brewing coffee, taking photographs, or repairing a model aircraft engine, sometimes with only a few lines of dialogue. [This emphasis on] the small wonders of everyday life makes the reader aware of their passing. In evoking a nostalgia for this loss, [the author] is following the Japanese aesthetic tradition of mono no aware. In fact, the stories can be so plotless and meandering as to create a slight remove from reality. But not too far removed from reality, even when fantasy elements dominate the narrative. Tamako Market is narrated by a talking bird. Kamichu! starts with Yurie getting turned into a Shinto goddess. Gingitsune is about a shrine maiden who can talk to her shrine's fox god. Flying Witch features, well, a flying witch (who, as it turns out, doesn't fly very much). Geography can also achieve that "slight remove." 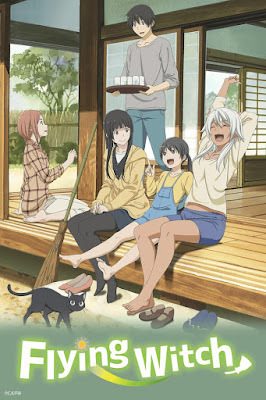 Flying Witch, Non Non Biyori, and Hanasaku Iroha are based in rural or exurbia Japan, while Kamichu! takes place in a fishing village near Kure on the outskirts of Hiroshima, and Barakamon on a small island off the coast of Kyushu. To the ninety-plus percent of Japan's urban population, these are magical settings that, as with NHK's perennial historical dramas, conjure up feelings of nostalgia for a bygone age that isn't quite yet gone for good in modern Japan. Though there's nothing wrong with the cities and the suburbs. 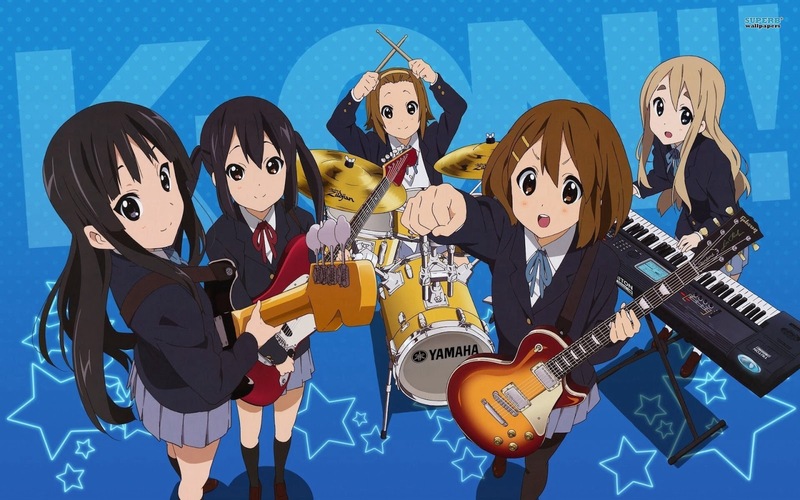 Consider the ever-popular K-On and Tamako Market (both recognizably made by the same production crew) and Strawberry Marshmallow. The slice-of-life comedy typically has one live wire to play the boke (funny man) to the rest of the tsukkomi (straight man) and lead our little gang into one (minor) crisis after another. Our boke needn't be a comedienne or ha-ha funny. Quirky will do. It usually does. Such as Yui, who joins a band when she can't play an instrument (K-On). Or Miu, a bundle of unconstrained kid id (Strawberry Marshmallow). 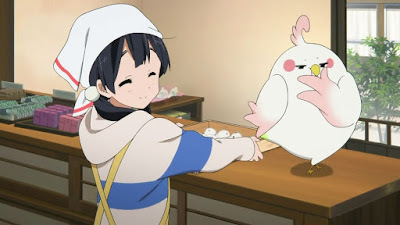 Dera Mochimazzi, the talking bird in Tamako Market, is basically Bob Hope in the "Road" pictures he did with Bing Crosby. But in all these cases, "real life" (or a close approximation thereof) eventually asserts itself, though with a focus on finding delight in the run-of-the-mill and beauty in the commonplace. "Hard" science fiction—science fiction that attempts to adhere to actual science—is hard. When making up stuff, the closer to reality, the higher the demands of verisimilitude. Almost nothing in a space opera like Star Wars is even scientifically plausible. Nobody cares because we accept from the start that it's closer in genre to a Disney fairy tale. Hollywood's been on a hard science fiction binge of late, to varying degrees of success. The physics in Interstellar is more wishful thinking than science. Gravity turns the laws of orbital mechanics upside down. But The Martian, which maroons Matt Damon on Mars, is basically Apollo 13 and Cast Away (minus most of the angst) set a few years in the future. In The Martian, man fights nature largely within the limits of current technology and without any bad guys out to purposely harm him. Oh, for a few minutes, they try to make Jeff Daniels into a villain to gin up some conflict. But two scenes later he goes back to playing a perfectly plausible NASA administrator. The simple yet daunting goal of Damon's Astronaut Mark Watney is to survive until a rescue mission can return to rescue him. The problem is that with current technology, getting from the Earth to Mars takes six months at best. So he's got a lot of problem solving to do. A major motion picture that is about nothing but problem solving is a breath of fresh air. Granted, in the space of two hours, the screenplay is going to have to gloss over a few aspects of the real world to keep the story moving. This is big budget motion picture, not a NOVA documentary. Like, I'm willing to give the radiation thing a pass, because no manned mission is going to Mars in the first place without solving that vexing problem. They don't solve it in the movie either, they simply ignore it, the same way they mostly ignore the .38 Gs of gravity on Mars. And unlike Tom Hanks shedding a real fifty pounds for Cast Away, Matt Damon didn't starve himself for the role; a scene toward the end showing us his gaunt frame (face hidden) is almost certainly a body double. He's wearing a space suit most of the time anyway. Tacking down the Pathfinder lander, plugging it in and powering it on (interplanetary cable standardization at last!) a quarter century after it landed is an eye-roller. Still, I could roll with it just because it's such a cute idea. And I loved the bit about digging up the RTG (radioisotope thermoelectric generator) and using it as a plutonium-powered handwarmer (accompanied by Damon's wry "Don't try this at home!" narration). No, what first suspended my suspension of disbelief was the implication (again, in order to create more obstacles to cleverly overcome) that the astronauts had only a single point of direct communication with Earth. In fact, the Mars landers use satellite uplinks to talk to the orbiters, which relay the signals to Earth ground stations. Likewise, it is beyond belief that an ATV the size of a small truck would be limited to line-of-sight communication. All of the later Apollo missions left working equipment and experiments on the Moon. The vehicle and the habitat would be studded with transponders and satellite dishes humming along long after the humans left. Equally improbable is that the inner hatch door of a habitat in a near-airless environment wouldn't be sealable and built into the superstructure. To quote NASA, the purpose of such a hatch is to "isolate the airlock from the crew cabin." I bet Astronaut Mark Watney sure wishes he had one of those. They were standard equipment on the Space Shuttle, after all. The first failure of the NASA resupply rocket was awfully predicable (more conflict creation). While I did appreciate bringing in the Chinese (China should be part of the ISS), the movie ignores that Russia, Japan, and the European Space Agency have comparable launch capabilities, not to mention ULA, Orbital ATK, and SpaceX. Given the chance to save the day, Elon Musk would be all over this. And yet I give it a solid A for effort. 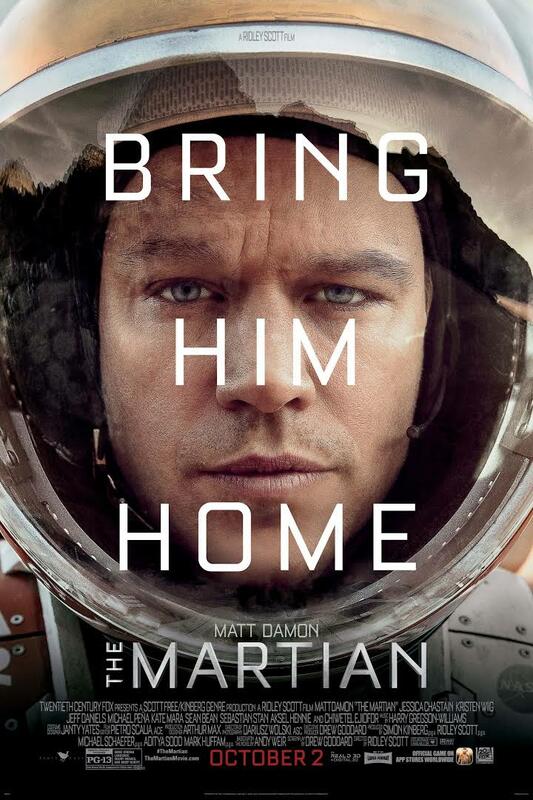 The Martian isn't one of those movies where the plot holes let all the air out of the suspense. It is a rousing Rubik's Cube of an adventure movie with a bunch of cheating aces tucked up its sleeve. Like the old Star Trek, it's often more interesting for its obvious flaws than for its dramatic successes. Since there isn't a high school karuta club, she needs five members to form an official one (an official club gets an advisor, a budget, and a room). Her first recruit is Taichi Mashima, one of the kids she learned karuta with in elementary school. The story then flashes back to their childhoods. Arata Wataya, the new kid in their elementary school homeroom class, is a karuta wizard, having been taught by his grandfather, a grand champion. Chihaya, Taichi and Arata venture to the community center to join the local karuta club. The club president, Dr. Harada, is overjoyed to find three new members on his doorstep. Taichi is better than Chihaya. Arata is in a league of his own. But Chihaya is undaunted in her quest to be the best. After elementary school, the three of them go their separate ways. In Japan, kids in the same neighborhood will usually attend the same elementary school; starting with junior high, the school they attend depends more on their academic goals and abilities. Taichi is accepted into a prestigious junior high. Arata returns with his family to far-flung Fukui when his grandfather falls ill and grows out of touch. When we next meet him as an older teen, he speaks with a strong Hokuriku accent. Arata has also grown out of touch with karuta. The most poignant dramatic arc in the first season involves Chihaya's efforts to re-inspire the person who first inspired her. Now in high school, Chihaya has reached A-level, the highest rank in competitive karuta. But she's far from the top. Taichi hasn't played since elementary school but gets dragged along by Chihaya's enthusiasm. With another classmate they once competed with and two rookies, the club is on. 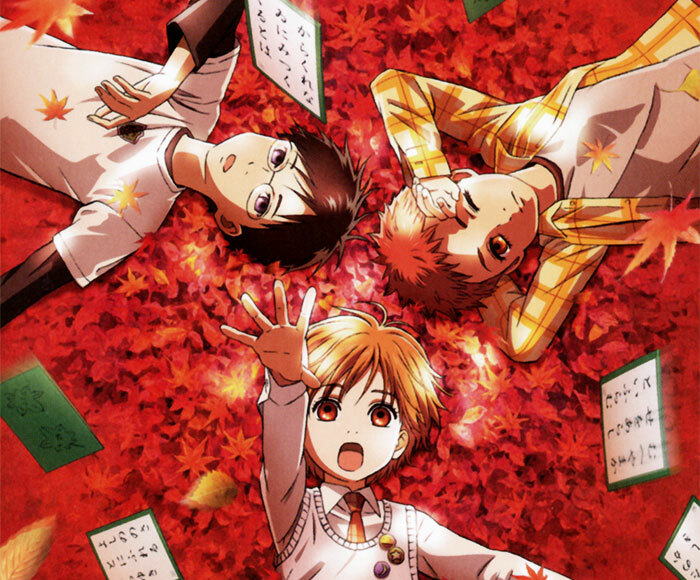 Chihayafuru follows the basic structure of the high school anime sports series. A big difference is that karuta isn't exactly a spectator sport. At first, there's no way to replay an entire karuta game in real time and hold our interest. As the players get better and we become more familiar with the game, the competitions get longer, and begin to approximate real time. Similar to The Big Windup, commentary comes in the form of inner monologues that reveal the strategies, strengths, and weaknesses of each player and team. Character profiles of the players and their opponents—examining what drew them to such an obscure and difficult sport in the first place—are depicted in often surprisingly intense melodramatic vignettes (accompanied by lush orchestration). Now, stories about melodramatic teens usually appeal to me as much as fingernails scraping across a blackboard. A big problem with otherwise compelling teen romances like Kimi ni Todoke is that, as Kate puts it, the characters have too much time to "sit and around and get angsty." A job, a sport, a serious hobby helps to mitigate that. 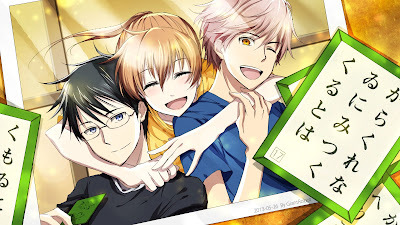 The nascent love triangle (usually another annoying dramatic device) in Chihayafuru stays mostly nascent, largely because Arata is on the other side of Japan. And Chihaya's monomaniacal focus on karuta precludes such distractions. Neither is it resolved (I'll have to start reading the manga). But there is a pay-off in the penultimate episode of season two when Kanade (the club medievalist) realizes the implications of a poem Chihaya wrote for a homework assignment and lectures Taichi to pick up his game (a cute scene). So there's a lot more involved than the protagonist going from success to success. Common to anime sports series,the struggle, the hard work and effort, the growth and the team effort are what matter the most. Kanade insists they wear traditional hakama and learn what the poems mean (think of how well the average educated person understands Chaucer). The club nerd calculates "batting averages" based on card placement. Taichi and Nikuman-kun rise quickly to match Chihaya's abilities. For Chihaya, being the biggest fish in her own small pond doesn't mean there is nothing more for her to learn right where she is. She's still got a long way to go to become the "queen" of karuta. But her unrelenting passion for a game based on medieval poetry will surely take her there. Crunchyroll has both seasons of the anime (scroll down for season one). The two live-action movies aren't available in the U.S. There are two Japanese/English bilingual volumes of the manga (more in French, for some reason) and thirty-one so far in Japanese (over ten million copies in print). Granted, at first it'll make about as much sense as, well, Cricket (though it should be obvious when a "dead" card is read). But once you've watched a season of Chihayafuru, you'll know exactly what is going on, even if you don't understand a word of Japanese. As discussed previously, there's a manga or anime for practically every sport, an entire subgenre for baseball alone. Competition makes for conflict and great story material, and that includes a fascinating series about a literary card game that quickly became one of my all-time favorites. The game is kyougi (competitive) karuta, the latter word borrowed from the Portuguese carta during the Edo period and applied to Japanese playing cards in general. 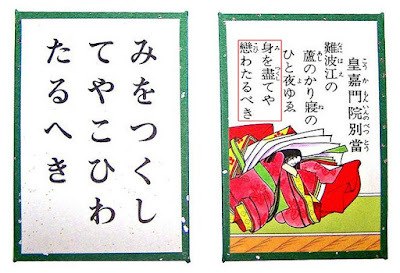 Here it refers specifically to the game of "singing karuta" or uta-garuta. To be sure, even in Japan, more people know about karuta than can play with it with any competence. The Tokyo high school baseball regionals involve hundreds of teams. Only a dozen or so can muster enough members to compete in the Tokyo karuta regionals. They'd all fit in a single gymnasium with room to spare. 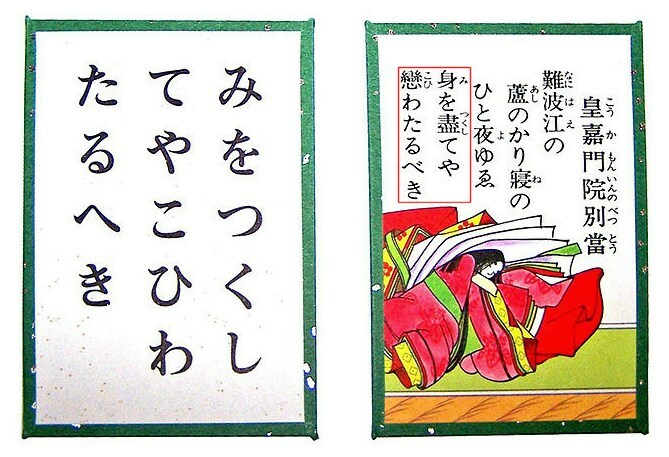 The centuries-old game is based on a Heian period poetry collection known as the Ogura Hyakunin Isshu ("One hundred poems by one hundred poets"), compiled by the court noble Fujiwara no Teika in the 13th century. Not the kind of game that makes the average teenager sit up and take note. 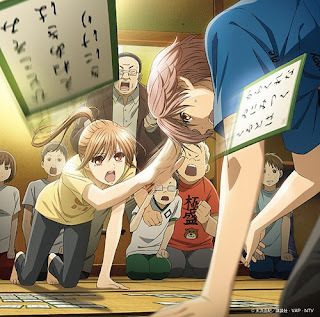 In competitive karuta, given the first three lines of a waka, players pick the card with the last two lines. Skilled players can identify cards by the first one or two syllables of the poem. The game involves lots of memorization, short-term spatial memory, sharp hearing, and good reflexes. The best players become experts in assimilation and coarticulation, the phonological processes by which the articulation of one phoneme influences the pronunciation of the next. That way, two poems that begin with identical syllables can be differentiated before the second syllable is spoken. Fifty cards of the one hundred are randomly selected, each player receiving twenty-five, which they arrange in front of them. They have fifteen minutes to memorize the cards before the game begins. So players line up their cards to maximize ease of location and speed of identification. A reader proceeds through a full, randomized deck (there are CDs to practice with: set the player to shuffle play), meaning that fifty cards will not be in play. Mistakenly choosing a "dead" card will cost one of your own. A live card can be—is often—selected from the group with a sweep of the arm. With well-matched players, quick reactions matter, so this sweeping motion may be executed with considerable force, sending the cards flying. Multiple cards can be selected if the target card is included. Towards the end of a match, a player can group his remaining cards together and hit them all at the same time; though if none of those cards are the right card, a penalty is exacted. A player can also reach over and grab a card from his opponent's side (which requires being able to read the cards upside down), and then give his opponent one of his own (again, a strategic move). The first person to empty out his side wins. The result is a formal poetry reading combined with a fast-moving athletic performance that gives competitive karuta a "chess boxing" vibe. It really is "poetry in motion." The NHK World video below explains the rules of the game, and how phonology, statistics, and speed figure into winning strategies. Oh, and that anime series? As referenced in the video, it's Chihayafuru. More about it next time.